Firstly, I decided one evening to eat outside my hotel and visited a charming restaurant in downtown Luxor. It was warm and I was glad of the air conditioning. No sooner had I given my order – for a rather tasty Egyptian tagine – than all the lights went out and, yes, you guessed it, the air conditioning unit shut down. Apparently these power cuts were a daily – even several times daily – occurrence. Candles immediately appeared on all the tables and each of the waiters carried a small battery operated torch. Luckily an emergency generator kept the kitchen operational. But as the temperature started to rise (no air conditioning and all those candles) it struck me what a challenge it must be for local businesses having to deal with this type of interruption to their service on a nightly basis, and at peak trade. As one of the staff said to me, “When this happens in the evenings we’re at home, the heat and the pitch dark mean all you can do is lie down and pretend to be a vegetable.” I loved the prosaic attitude. But with temperatures at this time of year regularly hitting 40 degrees (and not cooling off much at night), it made me realise how much we tourists take the electricity supply for granted. Of course, the power cuts don’t affect the hotels because they have their own on site generators. Apparently the power cuts are the result of the government’s agreement to sell electricity to Israel. This link is the latest I’ve been able to discover about this agreement. I couldn’t quite make up my mind what I thought about all this. One one hand, I understand the government’s need to underpin the Egyptian economy – which relies so heavily on tourism (so sadly depleted since the revolution) and agriculture. But for this to be at the expense of local businesses struggling to keep their own heads above water during these tough times didn’t sit completely comfortably with me. 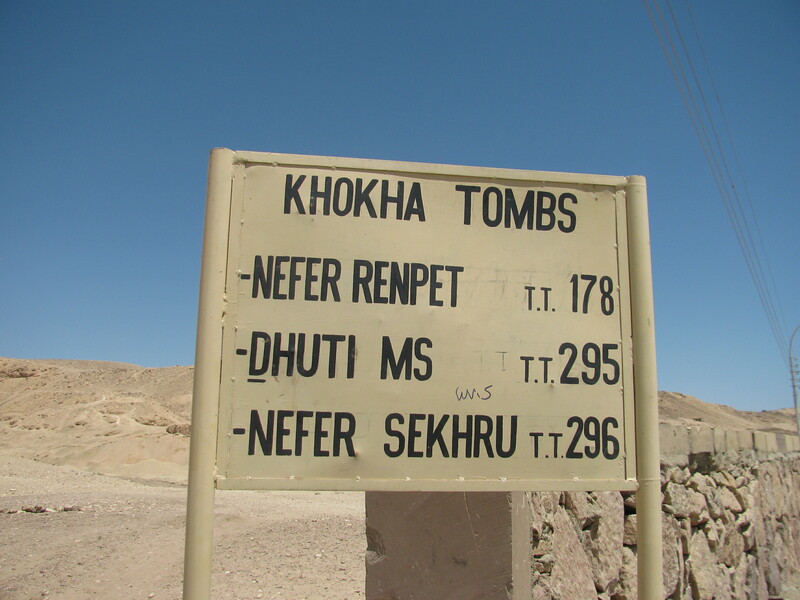 The second experience that gave me pause for thought was during a trip to the West Bank to visit some of the tombs of the nobles. These tombs riddle the Theban Hills giving it something of the appearance of a mountainous Swiss cheese. What’s fascinating is that over the centuries a modern village called Gurneh sprang up on the hillside, in many cases with the dwellings built literally on top of the ancient tombs. I remember on my first visit to Luxor in the 1980’s, the village was still there – although over the last decade or so the villagers have largely been relocated to the modern, purpose built New Gurneh to enable proper excavation of the Nobles’ tombs to take place. My taxi driver for my excursion to the West Bank was a friendly chap (I’ve yet to meet an unfriendly one) called Hassan. Once he’d deposited me at the tombs I’d chosen to explore (see my previous blog about the El Khokha tombs), he then offered to drive me around the village of New Gurneh so I could see for myself the new homes so many people have relocated to. I was impressed. He showed me the school and the hospital. Then, on the return journey, he suggested I might like to call in on his family for some tea. Being decidedly hot and dusty by this stage, this was an appealing idea. The Egyptian tea is hot and sweet, served without milk, and usually with fresh mint. He took me to a rather tumbledown mud brick house near the canal that runs inland from the Nile along the West Bank. It was deliciously cool inside, the windows shuttered and the thick mud brick walls keeping the heat of the sun out. The interesting thing was that tea wasn’t the only thing I was offered. As I sipped the hot, fragrant beverage, his brother brought me a selection of ancient Egyptian artefacts to look at. Hassan carefully explained in rather broken English that his family grew up in the old village of Gurneh. Many of them had ancient tombs as cellars. As children they made a habit of digging for treasure, and the artefacts I was being shown now represented just one families’ collection. There were lots of small carved figurines made from faience, and small stone scarabs and carved cats. The piece de resistance was an exquisitely carved stone head of a pharaoh, complete with the uraeus snake rising from his brow. It was heavy, probably solid granite, and rested in my palm, probably about the size of a large orange. Perhaps unsurprisingly, Hassan and his brother very keen for me to make an offer on any of the pieces that took my fancy. This presented me with something of a dilemma. I did not wish to appear rude in the face of their hospitality and I could certainly sympathise with their attempts to supplement a no doubt meagre family income. But at the same time I had horrible visions of being stopped by customs officials at the airport and trying to explain how a genuine pharaonic artefact came to be in my luggage. It was enough to bring me out in a cold sweat. But it made me wonder … If this was just one families’ selection of the artefacts they’d dug up, effectively from their own back yards, how many more such exquisite and possibly important pieces must there be stored in cupboards and boxes in the homes of the ordinary people of Luxor’s West Bank? 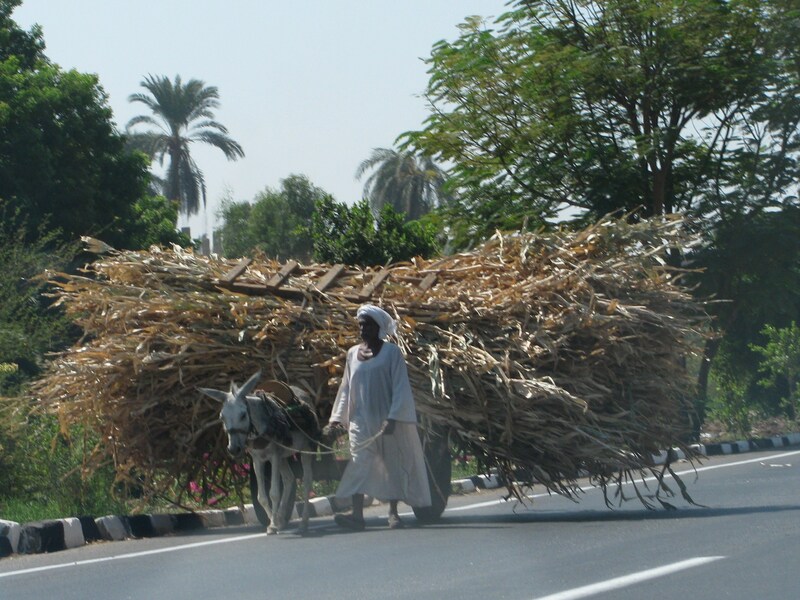 The Egyptian people live a simple agricultural life. I’ll be honest, I was a little bit horrified to be offered antiquities for sale in a private home. But “finders-keepers” is a deep-seated concept in many cultures. So who am I to judge these warm, welcoming people for trying to earn a few extra pennies from the ancient Egyptian artefacts that literally turned up under the floorboards, so to speak? I resisted the temptation and eased my conscience with a generous tip when Hassan deposited me back at my hotel. So, the economy in Egypt is struggling and the local people seize whatever opportunities they can to make a living in often difficult circumstances. I admire them. And I do what I can… just small things like preferring to visit the sites by taxi and in the company of an Egyptian guide, rather than on an organised tour with one of the travel agencies. I’d rather put my money in the pockets of the local people where possible. These little slices of everyday Egyptian life are so special. I am a writer, and have so far published three mystery/adventure stories set in present-day Egypt, so experiences like these are invaluable. I have been back from my most recent trip for a few weeks now. When I look back I find it is not the tombs and temples that made the most significant impression on this occasion. I remember the night the lights went out in the restaurant, and I remember the thrill of handling a genuine artefact in a humble homestead on the West Bank. 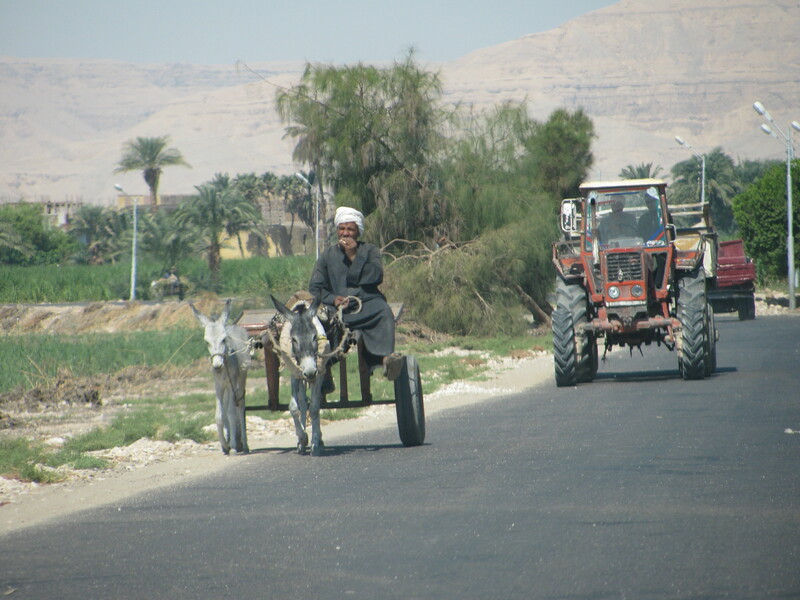 These are memories to treasure – a little slice of the real Egypt outside the tourist bubble. Author of Carter’s Conundrums, Tutankhamun’s Triumph and Hatshepsut’s Hideaway – following Meredith Pink’s Adventures in Egypt – all available in Kindle or paperback on Amazon.com and Amazon.co.uk. Posted on June 15, 2013 by Fiona Deal. This entry was posted in ancient Egypt, Egypt, egyptian fiction, History, Travel, Uncategorized. Bookmark the permalink.